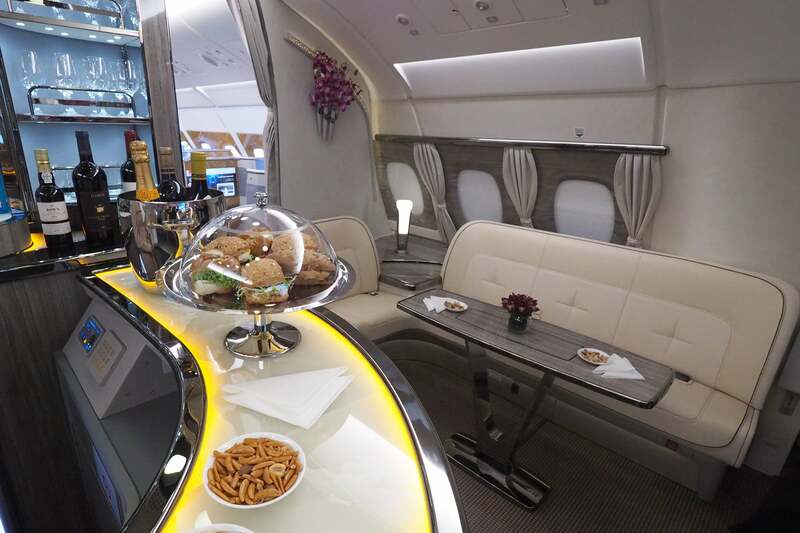 Typically, Emirates takes delivery of its A380s without much fanfare. Engineers will inspect and sign off on the plane, and pilots will head out to Airbus’ Hamburg, Germany facility, flying the brand-new aircraft back to the carrier’s home airport in Dubai. But Friday’s ceremony was an entirely different affair. It marked the carrier’s 100th A380 delivery, and, since Emirates is the largest superjumbo operator by a long shot, most likely the only 100th A380 delivery to ever take place. At this point, Emirates now operates more than five times the number of double-decker planes than the runner-up, Singapore Airlines, which is mighty impressive. Now, while the event itself was especially notable, this particular aircraft isn’t distinguishable from several others in the fleet, with the exception of its custom livery. While they do sport the latest finishes and amenities, the first, business and economy-class cabins aren’t entirely new. 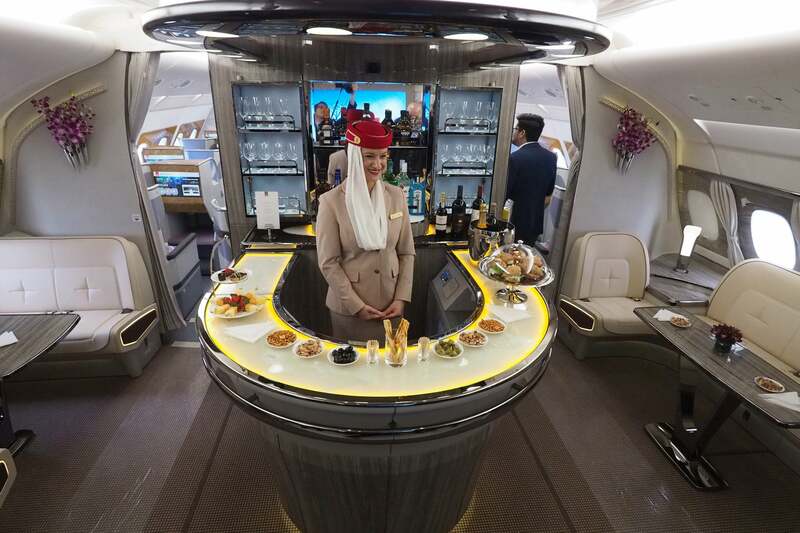 This A380 is one of the first to offer the entirely redesigned upper-deck bar, though, so that’s where I spent the majority of my time onboard today. 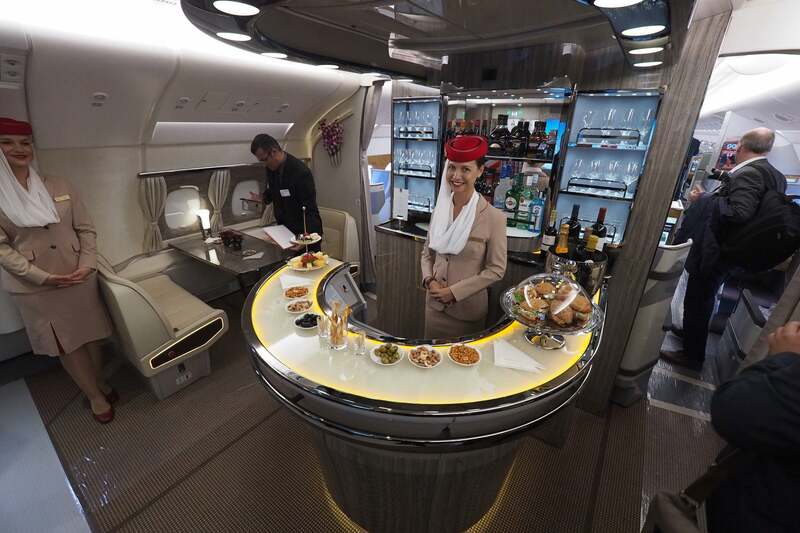 I already loved Emirates’ A380 bar, but this redesign takes the concept to a whole new level. Check it out in the video tour below. 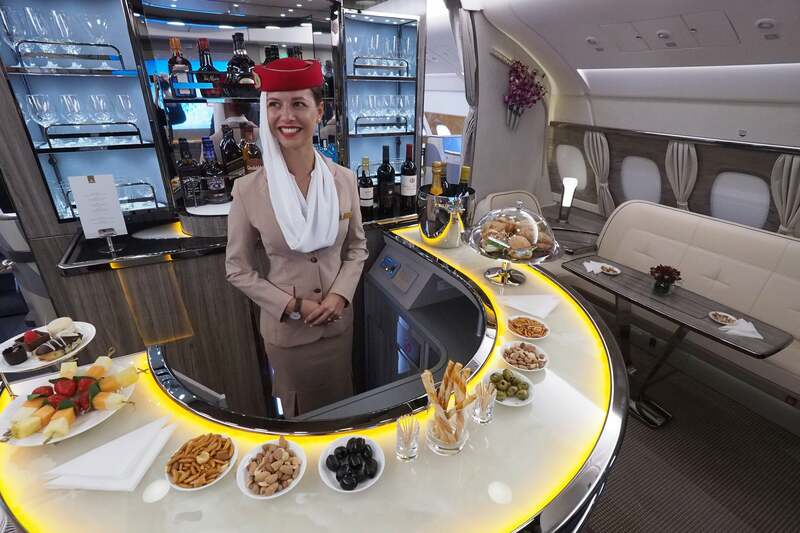 Tour the brand-new business-class bar on Emirates' 100th A380, live from the Airbus Delivery Center in Hamburg, Germany with TPG Editor-at-Large Zach Honig. The bar looks even better in person than it did in the carrier’s intro video earlier this year. It’s seriously stunning. While I love the bar itself, I’m especially taken with the two seating areas. There’s seating for four (or three with seat belts) in an L-shaped sofa on the starboard side. And then my favorite seating area is on the port side of the plane, just to the left of the staffed bar. 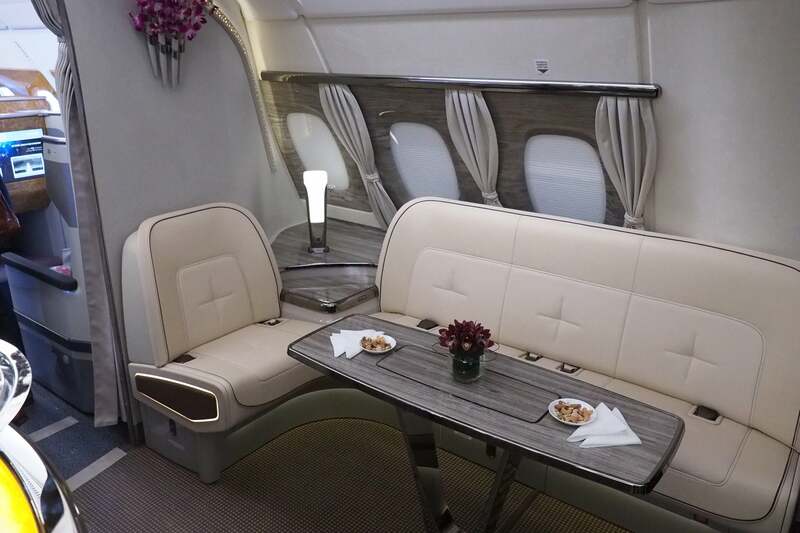 Now, I’ve never had an opportunity to fly business class with three friends or family members — well, with one exception, perhaps — but if I did this is definitely a spot I’d like to claim for my group! It could also be fun to sit there and chat with strangers, too. I really love everything about the new bar, from the stand-up area in the center to the two seating sections near the windows. The new 55-inch TV, seen in the video above, is super awesome too — it supports streaming television, making it possible to watch live programming, such as sporting events, during a flight. 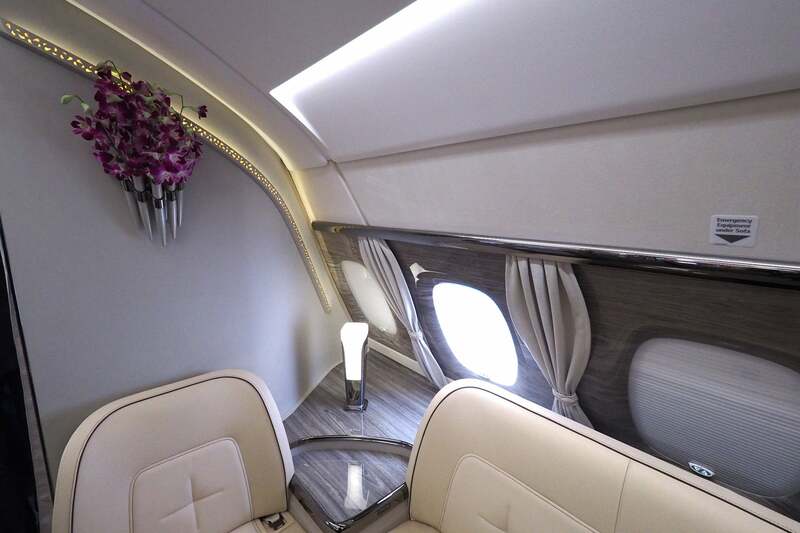 But what really sets Emirates’ bar apart is the attention to detail — just look at the window treatments, wall finishes and even the bouquet of orchids. I’m told there are seven planes with the new bar flying today, and this latest A380 makes eight. 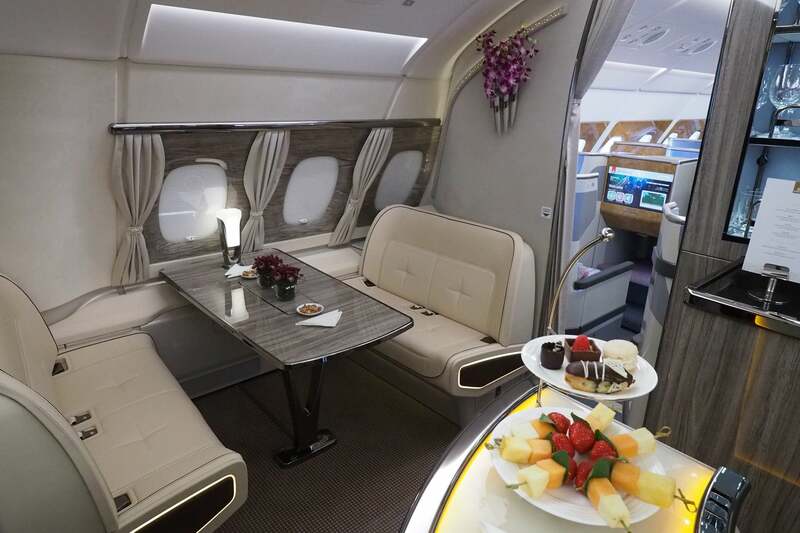 Unfortunately landing one of these latest aircraft is a bit hit or miss — if I ever get lucky enough to score the new plane, I can’t imagine I’ll be spending much time sitting in my business-class seat, though.